Willa Obenchain’s quiet strength will stay with me for a long time, and so will this beautifully written story of the New York frontier. Taken captive by the Iroquois as a child, Willa now returns to her white village near present-day Herkimer, uncertain of her place in either world. She finds more questions than answers in the abandoned farmstead of her parents, whose loyalty in the recently ended Revolution is questioned. Locals from Shiloh, especially a former love interest Richard Waring, claim her parents disloyal to the patriot cause, and threaten to confiscate her land. To complicate matters, Willa’s sworn solitude has been invaded by a wounded botanist—Neil MacGregor—whom she takes in, and who in turn charms her grieving heart. Clues about her past come into focus in the ethereal visits of a mysterious boy in the woods. Francis Waring is a heartbreakingly pure soul and the polar opposite of his brutal older brother Richard. Francis’ underdog simplicity and vulnerability drew me more powerfully than any other force in this deeply moving novel. This book has depth that haunts your heart and an uplifting power that ascends to. . .well, the Burning Sky. For me, this is the best read of this year, by far. Bravo, Lori Benton on a breathtaking debut. Don't forget that we have an ongoing giveaway of this gorgeous novel. Leave a comment to be entered! A winner will be chosen by random.org on Friday. Good luck! 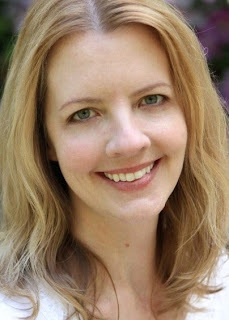 This week we are celebrating Lori Benton's fabulous debut with an interview today, a review Wednesday, and a giveaway on Friday! Be sure to leave a comment with your email to enter both today and Wednesday. Welcome Lori! We are so happy to have you here this week, and thrilled that you have agreed to share a bit about yourself. A: I remember it well. 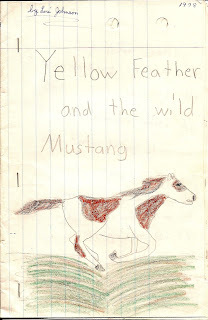 I was nine years old when my best friend announced (already an avid reader) that she had written a story. She showed it to me, and that was a moment of revelation. Anyone, whenever they felt like it, could write their own story, about whatever they wanted. Of course I had to give it a go. 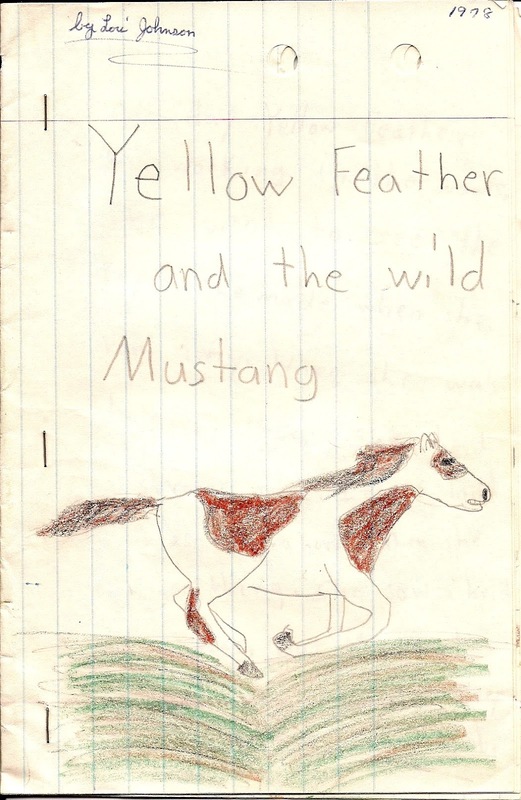 I wrote Yellow Feather and the Wild Mustang (and thanks to a grandmother who saved that story, dated 1978, I still have it). I never lost interest in storytelling from that day on, although writing took a back seat to painting for a few years during high school and art college. But in 1991 I began writing again with an eye toward one day being published. Q: How does New York State history play into your writing? 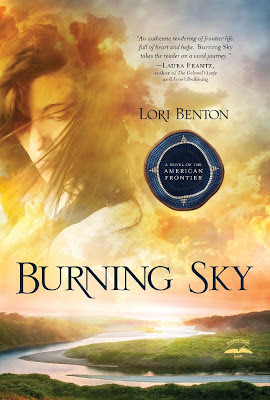 A: My debut novel, Burning Sky: A Novel of the American Frontier, is set in upstate New York in 1784, months after the Revolutionary War ceased raging in the back country so close to British Canada, and the inhabitants of the Mohawk Valley and along West Canada Creek were finally able to straggle back to their homesteads (if they still existed) and pick up the pieces of their lives. Burning Sky presents a portrait of one such (fictional) settlement at this time, and the scars that both the land and people were left to bear and overcome. European settlers and their neighbors the Iroquois, who experienced their own struggles, defeats, and triumphs during the War. A: The answer to this question evolves, since I’m always researching the 18th century, learning about the people of that time, sometimes scratching my head over their choices and actions—or marveling at their bravery and dedication. Just now a certain man comes to mind. I’ll introduce him, as I don’t believe he’s well known. His name was Peter Agwelentongwas, also known as Good Peter. He was an Oneida Indian who helped lead his people during the Revolutionary War era. Unlike most members of the other Iroquois Six Nations, the Oneidas fought for the patriots. And they suffered for it. Many Oneidas were by this time Christians. Good Peter, born in the 1720s, accepted Christ as his Savior in the 1750s. He was a warrior known for his fervent faith—he taught himself to read the Bible, translated into Mohawk—and for his loving nature. In spite of the terrible poverty and suffering the Oneidas experienced after the war, he maintained a hopeful optimism about his nation. He would travel from village to village, offering kind words and prayers, singing hymns, and preaching sermons to encourage his brothers and sisters, until his death in 1794. This is what I’d like to ask Good Peter. Tell me what is the reason for the hope that is in you? Not because I don’t already know the Answer for myself. Because I would very much like to sit beside this beloved man and hear him tell me about his Savior. Q: Beautiful portrait. I looked up Oquaga, where Good Peter regularly preached--near what is now Deposit, NY--and it's less than 2 hours from where I live. In that vein, who have been your mentors, and how did they help you most? A: So many writers have mentored me during my 20+ year writing journey, most of them unknowingly. Some of the best mentoring I’ve received has come from simply reading novels of the sort I long to write myself, paying attention to what it is that’s ringing that bell for me, and attempting to recreate it in my own words. There is one place where I’ve learned a great deal about writing fiction over the past 15 years, and that’s the Compuserve Books & Writers Community. It’s the oldest books and writers forum on the internet. It’s gone by different names over the years, and there are writers who’ve been members there since its inception. One of them is bestselling author Diana Gabaldon, and it’s down to her books that I became interested in the 18th century in the first place. I’ve learned much about writing from Diana, and others on the forum, many of them multi-published authors and journalists. But there was one woman, Lauri Klobas, who had never published any fiction of her own, who helped me tremendously. Lauri had a gift for editing, especially for wading through a tangle of overwritten prose like I once produced (and still often do in my first drafts), and cutting away the excess to find the core of a story. It’s largely because of Lauri that my writing finally captured the eye of an agent, and I’ve dedicated Burning Sky in her memory. Q: What do you hope your readers will take away from Burning Sky and your other books in general? A: Aside from the obvious—being entertained and feeling like they've gained a new circle of friends in the characters—I would like the reader who finishes Burning Sky to be encouraged and reaffirmed that God is working all things together for good in their lives. That they can trust Him without fear, through pain and disappointment, through hardship and hard work, no matter what the situation looks like on the ground. He has good plans for us, blessings now, and on into eternity. A: I’ll put to them the same question you asked me (it’s a good one!). If you could sit down and interview any person, from any time, who would that be, and what is the first question you would ask? Thank you for being with us this week. I wish you every blessing as you write for His glory! Abducted by Mohawk Indians at fourteen and renamed Burning Sky, Willa Obenchain is driven to return to her family’s New York frontier homestead after many years building a life with the People. At the boundary of her father’s property, Willa discovers a wounded Scotsman lying in her path and feels obliged to nurse his injuries. The two quickly find much has changed during Willa’s twelve-year absence—her childhood home is in disrepair, her missing parents are rumored to be Tories, and the young Richard Waring she once admired has grown into a man twisted by the horrors of war and claiming ownership of the Obenchain land. When her Mohawk brother arrives and questions her place in the white world, the cultural divide blurs Willa’s vision. Can she follow Tames-His-Horse back to the People now that she is no longer Burning Sky? And what about Neil MacGregor, the kind and loyal botanist who does not fit into her plan for a solitary life, yet is now helping her revive her farm? In the aftermath of the Revolutionary War, strong feelings against “savages” abound in the nearby village of Shiloh, leaving Willa’s safety unsure. Willa is a woman caught between two worlds. As tensions rise, challenging her shielded heart, the woman called Burning Sky must find a new courage—the courage to again risk embracing the blessings the Almighty wants to bestow. Is she brave enough to love again? I am giving away a copy of this beautiful book to one lucky commenter. Answer Lori's question about who in history you would love to interview, and you might win this beautiful story of the NY frontier. 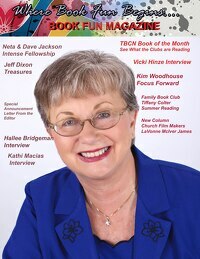 To increase your chances of winning, tell me if you follow this blog, Lori's blog or FB author page, or share on Twitter, FB, or Google+ That gives you 8 chances. Good luck! I recently watched the film Copperhead with my family. I'd been excited about the project since hearing about it this spring, and waited for it to come to a theater near me. Well, I waited and waited, and eventually, the producer, Ron Maxwell decided to release it on other venues concurrent with the big screen. Lucky for me! We watched it on AppleTV in the comfort of our own living room. It is also available on itunes and Amazon. Based on the novel The Copperhead by Harold Frederic, the film was shot at Kings Landing Historical Settlement in rural New Brunswick, a collection of reconstructed 19th century buildings, which gives the film a wonderfully authentic period feel. The Beech family runs a dairy farm in a small northern NY town during the Civil War. The father (the Copperhead) is a Peace Democrat, pro-union and constitution, and opposes Lincoln's war. His son Thomas Jefferson Beech is in love with the lovely young school teacher, Esther Hagadorn, daughter of a firebrand and pro-Lincoln Republican Jee Hagadorn. The townspeople, predominantly Republican and whipped up into a lather by Jee, turn against Mr. Beech and refuse to do business with him for his Copperhead beliefs. When Thomas enlists to impress Esther, he leaves his family without a proper goodbye. The political strife stirs up murderous hate among former friends--can neighbors overcome war fever, or will their blind wrath turn deadly? Very passionate portrayals of the two fathers by Billy Campbell as Abner Beech and Angus MacFadyen as Jee Hagadorn--(you might remember Angus MacFadyen playing Robert the Bruce in Braveheart). I liked the son of the Republican firebrand, Ni Hagadorn played by Augustus Prew, though his dialogue was sometimes mumbled and hard to decipher. He had some really quotable lines toward the end in his Love Thy Neighbor speech. The cinematography was beautiful, and of course I loved the setting of Civil War upstate NY brought to life. The film was family friendly--no violence, no language, no risque moments--and had a happy ending for the most part and a profound and timely message in today's politically divisive atmosphere. I thought it was worth seeing, especially for Civil War buffs and students of history. It brought to light the history of dissenters in the North to the war and taught the untold history of Copperhead politics better than any text book.. It's a subject that no one has explored much until now. I think the current administration and Lincoln have much in common with their executive overreach and trampling of the Constitution, so in many ways, those who loved the Union but didn't agree with Lincoln and his war have much in common with modern conservatives. Overall I gave it a 4 out of 5 stars for being unique, timely, and well played out.